Decorative rural mailboxes can take a boring curb and turn it into an artist’s delight. Instead of sticking with your traditional black mailbox, consider adding some spice and flair to your property with decorative rural mailboxes. For simple decorative rural mailboxes, homeowners may want to consider one of the many decorative painted mailboxes on the market. These mailboxes are often hand painted by artists, featuring the painted artwork on the body of a traditional mailbox. For those who like to change their mailbox look with the seasons, you can even find painted “covers” for mailboxes which can be changed easily throughout the year. If you really want to add some punch to your curb, many artists are now creating animal themed mailboxes. Homeowners can get a custom made decorative rural mailbox in the shape of many animals like the cat, dog, horse, bird, flamingo and much more. In fact, some artists are even making plane and vehicle mailboxes as well. These mailboxes are wild and bold but they are USPS regulated which means they are completely accepted to hold delivered mail. While decorative rural mailboxes often bring to mind the above mentioned varieties, homeowners can get decorative without being as bold as installing a dog shaped mailbox on the curb. Instead, they can choose elegant and decorative rural mailboxes with the architectural theme. This theme allows homeowners to have a decorative appeal to their mailbox without going too far outside the box. 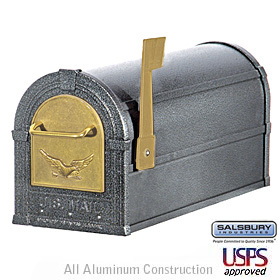 Many of the architectural mailboxes can be found or ordered at local home improvement stores or online.